Bet72 are delighted to announce that another excellent company has joined our recommended ranks Matchbook and we have a fabulous EXCLUSIVE risk free £20 bet for all to celebrate look…. Register with Matchbook today and bet risk free up to £20. Place a £10 back bet and £10 lay bet to get up to £20 free bet if you don’t win. In order to qualify for the free bet, your first back bet must be staked at odds of 2.50 or less and the lay bet at odds of 1.67 or bigger. Any winnings from your initial bet are yours to keep, but if you lose Matchbook will credit your account with a free bet equal to your losing funds up to a maximum of £20. The free bet will be credited within 48 hours of your qualifying bet being settled and must be rolled over 5 times before funds can be withdrawn. Fantastic a totally risk free bet of £20! But this is an EXCLUSIVE offer and is not featured on their regular site. So remember to click on the banner below to be eligible. The key is to underlay the bet on the exchange so that if the bet does win then whilst you won’t get the refund, you lose less at the exchange and have locked in a profit. Naturally if the bet loses you will win on the other exchange you use and your free £20 stake returned. So you could treat this a great value punt. So in effect you treat the sign up offer in exactly the same way as cashing out a stake not returned free bet, so aim for higher odds to maximum the potential profit. And because Matchbook is a betting exchange itself you will be getting excellent odds to make the very most of this sign up offer and of course future bets as well. You can have it all worked out on the every so handy Bet72 Matched Betting Calculator here (just sign up to our mailing list for a free spreadsheet version) or just drop us a line at info@bet72.com and we will work some out for you no problem. *** One little tip *** For super speedy payouts from these guys we would also recommend that you use a either a Neteller or Skrill account. They are fast! You can find out more about these online wallets in our article here. Matchbook itself has been in operation since 2004 but was acquired in 2011 by a group of investors with background in the UK sports wagering and banking sectors and has enjoyed steady growth with a mission of offering the best odds, great liquidity, and the lowest commissions will soon revolutionize the way people bet and trade sports. Offer applies to new Matchbook customers who register at URL https://www.matchbook.com having been directed via an applicable promotional link from 00:01 GMT 18 September 2015 until such time as Matchbook determines in its sole discretion. Offer applies to customers that place both a £10 back bet and a £10 lay bet on a minimum of two separate betting markets on Matchbook’s betting exchange. Place your first back bet in the amount of £10 and your first lay bet in the amount of £10 on Matchbook.com and, if either of your bets lose, you will be refunded the amounts of the bets that you lose as bonus funds (the ‘Bonus Funds’). If you place your first £10 back bet without also placing a £10 lay bet on a separate betting market, then you will not be eligible for any Bonus Funds. If you place your first £10 lay bet without also placing a £10 back bet on a separate betting market, then you will not be eligible for any Bonus Funds. If both of the first back bet and the first lay bet that you place win, then you will not be eligible for any Bonus Funds. The maximum amount of Bonus Funds that will be awarded under this promotion is £20. Bets placed must be staked at odds of 1.67 or greater if a lay bet, or at 2.50 or less if lay bets. Odds quoted in these terms are in decimal format. Offer applies to the first £10 back bet and the first £10 lay bet that you place, not the first back bet and the first lay bet that are settled. Any Bonus Funds that you are awarded may not be used as stake for any bets that you place under this promotion. All Bonus Funds will be credited WITHIN 48 HOURS of the qualifying criteria being met. Bonus Funds can only be withdrawn after the amount of those Bonus Funds has been rolled over at least five (5) times on Matchbook’s betting exchange. For roll over purposes, risk is calculated on the basis of the lesser of the stake or potential win amount. For example, if you are awarded Bonus Funds of £20 and win £5 using those Bonus Funds, you will be deemed to have rolled over only £5. You must therefore roll over an additional £15 in order to complete one (1) roll over. You must then roll over £20 a further four (4) times in order to have risked a total of £100, thereby entitling you to withdraw the Bonus Funds. Any request by a customer to withdraw Bonus Funds will not be processed unless and until the Bonus Funds credited to that customer’s account have been rolled over in accordance with these promotional terms and conditions. Offer only applies to registered customers from the following countries: Australia, Austria, Denmark, Finland, Germany, Ireland, Japan, Netherlands, Slovenia, Sweden, Switzerland, and United Kingdom. Only one Bonus Funds offer per household/IP address or device. Funds must be risked on Matchbook’s betting exchange and cannot be bet against your own account. Void bets do not qualify for this offer. Monetary values are expressed in Pounds Sterling (‘£’) for convenience; equivalent currencies are accepted at a value or an exchange rate determined by Triplebet Limited. Triplebet Limited reserves the right to amend these promotional terms and conditions or terminate this promotion at any time. Some things in life just get better with age (well at least that is what I tell Mrs. Bet72 anyway) and we have some great news from BETDAQ as they have made their free bet offer even easier for all UK and Ireland customers. £30 Risk Free Bet! Open an account with betdaq, place your first bet and if it loses they will give you a free bet up to £30. Offer applies to UK & Ireland. The Rest Of The World Offer is the original staged free £200 deal. This is one offer that will make a real difference to your profit margins, with EVERY risk free bet you place. Remember to make any free bet a risk free bet then one needs to have an account at a Betting Exchange to lay their bets off with, and typically people goto BETFAIR as their first stop. Well at bet72 we have always recommended that everyone has a second betting exchange account, as you never know when you might need it. Technology, including websites, are not always there when you need them most. So nowadays you really do need both a BETFAIR account and a BETDAQ one, there is really no reason not to. Plus you will also get the benefit of a 3% commission rate so you will be making extra on every single risk free bet you do anyway! How’s that for a double bonus. Lower commission on every risk free bet and a risk free bet to start with, that is a real the no brainer! And don’t worry if you already have an account, you can still get the new commission rate, just drop them a line asking to be included (that’s what we did). And we now have a cool low 3% commission rate on all our exchange bets / trades. Make 2012 your purple year! *€/£30 No Lose First Bet Terms and Conditions (Promotion for UK and Irish residents only) • To avail of the no lose first bet customers should ensure that promotional code ALLBDQ04 is entered on registration. • Customers first settled bet must be a bet of €/£/$30 or more on our betting exchange and if it loses we will credit the account with a free €/£/$30 bet. • 1st bet liability must be €/£/$30 or over on a selection, back or lay, on any single sports market at settlement. Multiple and 1bet bets will not Qualify. • Free bet will be paid into accounts which have met all qualifying conditions within 72 hours. • Free Bet is non-withdrawable and must be bet with at odds of 2.0 or greater. • Members cannot match themselves. • Offer applies to first time BETDAQ customers only. • Customers must satisfy all criteria required by BETDAQ for account opening including but not limited to age and identity verification. • Free Bet offer applies to new accounts opened between April 4th 2012 and July 31st 2012 only. • Free Bet stake is not returned on winning free bets. Free Bet can be used on the exchange including the mobile exchange app. Free Bets cannot be used on Multiples, 1Bet, Games or Poker. Free Bets must be used within 3 months of being awarded. • Void bets do not qualify for this offer. • The €/£/$30 no lose bet promotion is only available to residents in the United Kingdom and Ireland. • BETDAQ Terms and Conditions apply. **€/£/$200 Free Bet Terms and Conditions • To avail of the €/£/$200 free bet promotion customers must enter code ALLBDQ03 at registration. • On paying €/£/$25 in exchange commission a qualifying customer will be given a €/£/$25 free bet. • For each additional €/£/$100 in exchange commission paid, the customer will be given an additional free bet of €/£/$25 until a cumulative total of €/£/$200 in free bets has been awarded. • Accounts which have met qualifying conditions will have free bets credited within 72 hours. • Free Bets balances cannot be withdrawn until they have been bet with at odds of 1.5 or greater. • Free Bet stake is not returned on winning free bets. Free Bets can be used on the exchange including the mobile exchange app. Free Bets cannot be used on Multiples, 1Bet, Games or Poker. Free Bets must be used within 3 months of being awarded. • BETDAQ Terms and Conditions apply. ***3% Commission Promotion Terms and Conditions: • Promotion applies to new registrants from January 1st 2012 until the offer is withdrawn by BETDAQ. • Qualifying customers will have a 3% commission rate applied to any bets placed between January 1st 2012 and December 31st 2012. • Net market winnings from bets placed at different commission rates will have a weighted average commission rate applied. General Terms Applicable to BETDAQ Promotions: • Offer applies to first time BETDAQ customers only. • Customers must satisfy all criteria required by BETDAQ for account opening including but not limited to age and identity verification. 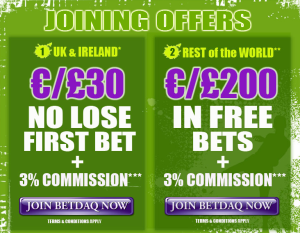 • Offer applies to new accounts opened from January 1st 2012 until such time as the promotion is withdrawn by BETDAQ. • Free Bet stake is not refunded on winning free bets. • Only one offer per household/IP address/device. • Customers availing of BETDAQ promotions may be required to provide a copy of a machine-readable passport before being eligible. • BETDAQ affiliates, consultants, employees are ineligible to use this promotion. • BETDAQ reserves the right to terminate this promotion at any time. • BETDAQ reserves the right to exclude any entrant from such promotions. • BETDAQ reserves the right to amend these Terms and Conditions at any stage. • Offer is not available to BETDAQ API or RDT customers. We have said it before, it is always to good to have a backup and that goes for betting exchanges too. So why not have the full monty of Betdaq, Betfair and now a WBX account. There has never been a better time to grab one as WBX are offering a free £10 bet once you have won / lost £100, but don’t worry we can make this all risk free. The bets could not be simpler as we can announce the WBX has been added to Oddsmatcher too, so it is all point and click profits! Then you can kick on a grab £15 more, so that is £25 worth of freebies. Also being a betting exchange then the odds will be are very close to the other exchanges meaning you can get maximum profits very easily. Note: Each New Member can only participate in one New Member Promotion. Click on Register Now on the home page and become a WBX Member. • Claim a further £5 free bet every time you earn 20 WBX Lifetime Points. This WBX Promotion is only available to new Members who are over 18 years of age. The promotion requires new Members to open a new WBX account. New Members are eligible to earn free bets for a period of one month from registration. When new Members have earned 2.94 WBX Lifetime Points they will automatically receive a token for a free back bet worth £10. When a new Member has earned 20 WBX Lifetime Points or subsequent 20 WBX Lifetime Points multiples thereafter up to 60 WBX Lifetime Points (i.e. 20 WBX Lifetime Points, 40 WBX Lifetime Points etc) they will automatically receive a token for a free back bet worth £5. Tokens may take up to one hour to appear within a Member’s account. Following market settlement, any profit from the free bets is paid to the Member’s account. The free bet stake is retained by WBX. Each new Member can only participate in this promotion once. This promotion is only available to new Members opening a new WBX account between 13th July 2010 and 31st August 2010. Free bet tokens are valid for use for one month from date of issue. Free bet tokens that have not been matched after one month shall lapse and be of no value. WBX reserves the right to amend or withdraw this promotion at any time without notice. WBX reserves the right to withhold payment of any winnings to Members if WBX believes that the spirit of the Promotion has been violated. All decisions taken by WBX in relation to this promotion shall be considered final. WBX Members who have opted for self-exclusion are not included in this promotion. It’s competition time here at bet72.com and we have teamed up with BETDAQ to bring you an ever so easy competition with a fantastic prize, 2 tickets for Celtic’s final game of the season (title presentation and all), at home to Hearts on Sunday 13th May, 12:30pm kick off. Congratulations Vince H just pulled out the hat for the tickets. Well done Vince and enjoy the game. And a big thanks to BETDAQ for the prize. We will be back with another competition very soon. Remember you have to be in it to win it so get your purple account now! It couldn’t be easier to enter too, just email us (info@bet72.com) your BETDAQ username by 12 noon on Friday 11th May and we will make a random draw that afternoon and if you are first out of the hat, the pair of tickets are yours, simple! And of course once you have an account you will also get the benefit of their unbeatable 3% commission rate for the whole of 2012 so you will be making extra on every single risk free bet you do and naturally BETDAQ are all up and running in our free bet finder software, ODDSMATCHER too. So this really is a no brainer. Plus we now have the very best sporting tips and more great new free tipping competitions for all users too courtesy of the purple site. We have regular advice and articles from Sky’s Ed Chamberlin and Alan McInally plus great tips from their very own DaqMan. As well as a couple of great daily free to enter tipping competitions so whether you are into 2 legged sport like football, come and see the BetDuck or prefer the 4 legged variety, then here’s the RaceCaller. Come and have a look….. So what are you waiting for, make 2012 your purple year! The Sport Exchange Shop in Warrington is now open for business. Had a fantastic opening day down there yesterday, a great buzz about the place, met some really nice people (some very, very good traders) and “Badger” was there helping with training and general trading advice. I am going to be a big part of this so if any bet72ers can get down there it would be great to meet you in person. Here is some extra info that Victor has put together to show you how the office have all come together. From the pre launch open evening….. The Sport Exchange Shop opens on 7th October 2009 – this is the North West’s only premier sports trading room with all the facilities you need to maximise your profits! Thanks to all who attended the recent open evening at the Shop, there were over 40 people turned up to what was a great night. Lots of people are asking about booking seats, free bets, getting training and how to make best use of the cutting edge technology at the shop. We have a great offer running through September with 25% off all first bookings for the October opening. Seats are limited and they are booking up already, if you want to make sure you have a seat take advantage of the offer and get booked in! The Badger is in the shop 22nd to 25th September running training courses. He will be dispensing his vast trading knowledge getting everyone ready for when the real action starts on open day! Through September Alan Thompson is inviting people to the Newcastle shop to do specialist training for in-running racing. He is in the Sport Exchange Shop 9th October if you want to book a session with Alan give me a call. Plus Darren Hall from bet72.com will be on hand to help you make all the risk free profits you will ever need. Darren is also available for personalised training sessions so again if you want to book a session with Darren just give me a call. If you are in the area (M6, Warrington) through September feel free to drop in for a coffee and chat and how we are setting up. The big day is on the 7th October, don’t miss out – book your seat now! We will offer all the facilities to give you the advantage to WIN. A friend of mine is looking to open a Betting Exchange Facility in the Warrington area, handy for me then! The aim is to provide a state of the art location with all the advantages to give you that extra edge. Modern offices coupled with fast PC’s, fast live pictures and fast internet feeds will give everyone the prefect trading environment. 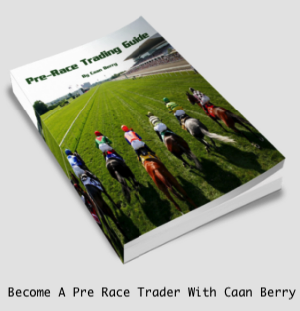 There will resident Betfair accredited trainers on hand to help, yours truly will be there running seminars and workshops on risk free betting and profit making and naturally a wealth of experienced pro traders to pick up hints and tips from. Initially we are looking to gauge the response of people in the surrounding area as to the overall idea and what they would like to see, naturally this won’t apply to everyone due to the location, although it will be right by the M62 so dead easy to get to, easy parking etc…so should appeal to a large catchment area. If you are interested then go along to http://www.sportexchangeshop.com/register.htm for more details and register an initial interest. I am the guy who has www.sportexchangeshop.com and for the last couple of months have been lining up what I need to get the shop open. It is a new venture for me and to be honest I would have liked to be up an running by now. As usual the first time you do something it takes 3 times longer than you think as you learn all the hoops you have to jump through – currently trying to persuade Warrington planners that my location is ok! Many thanks to all those who have contacted me and registered an interest through the website – this is really important to me to gauge interest and make sure I provide what people are looking for. Last thing I want is an expensive white elephant. Thanks also Darren at Bet72 for help, advice and encouragement. The location I am close to signing up to (planners permitting) is on the Gemini Business park in Warrington, it is close to motorways, has parking and is a modern office with good facilities. I plan to have SIS and TurfTV as well as Sky. If there is demand (and I hope there is) I’ll be putting a motor dish up to pick up football, tennis, NFL etc. I won’t be doing anything that might land me in jail or a large fine, but I am sure there are ways and means. There is fibre on the Park and I’ll be looking to get it in, don’t have a firm handle on connection speeds as yet. I’ll take internet over 3 separate ISPs – this means that the shop traffic is spread over multiple betfair servers = faster response times. Indicatively I’d like to charge £35 per seat per day or £180 for 6 days. I am relaxed about what software you use in the shop – if it is right for what you do that’s fine with me. Also happy for people to bring their own kit – so long as it does not affect other users, hog resources or bring the network down. I am keen to use the shop for training sessions, talks and any other trading/gambling/sporting uses. If you have ideas or requests please let me know. The idea behind the shop is to give any edge to help people to win and be successful – that means they come back more often and tell their mates about it.